It is remarkable to observe that during the fifth decade of his career Joseph Hughes, whose work has often been seen in the context of Radical Color Painting, is still experimenting and innovating. Yet, while assuming Color Painting's primary concern for the integration of support, surface, medium, pigment, and mark, Hughes' pursuit of a profoundly visual experience of color, light, and space remains uniquely open. Notably, his recent focus on emphatic gesture has resulted in particularly vibrant and sensitive, beautiful and intelligent paintings. It has also taken him into a new and exciting area of discovery. Hughes' palette is consistently intense and diverse, often even unusual. Thalo, Dioxazine, and Acra are powerful and luminous, yet these staining colors are so difficult to work with that most artists simply avoid them. 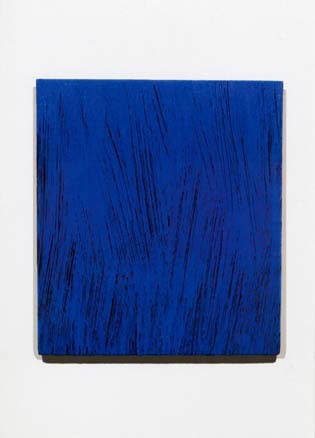 But even when Hughes uses the more common Ultramarine or Siena--and he has a special way with white and gray--his color remains clear and brilliant because his command of acrylic medium, used in alternating glazed and opaque areas, lets him achieve the jewel-like, lapidary qualities found, for example, in Rembrandt, whom Hughes greatly admires. Drawing is now more obviously important to Hughes in ways rarely found in Color Painting, where instead it is usually located at the edges of fields, shapes, and the canvas' periphery. Against Hughes' downward-flowing colored grounds, lines of paint are literally flung at the canvas; the presence of the painter's body in making these paintings is clearly evident. The pressure of thrown paint forces these lines to subtly fray and splatter out and upward at their edges. Across the painting's surface, arcs of color gracefully run parallel, touch, or crisscross, forming variously sparse or dense fields of interwoven lines. 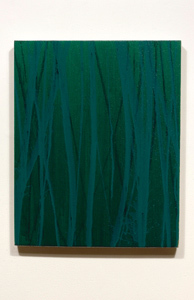 On the vertical plane of 2008/III (THALO GREEN), for example, a few thin dark green lines sketch a basic scaffolding on a medium green background, over which thicker skeins of turquoise accumulate as a grove of tangled trunks. The opposing directions of the downward-flowing background and the foreground figures reaching up suggest movement and tension, like the body's struggle to remain upright means resisting gravity's pull. In this Hughes risks the associations that the figure-ground dichotomy introduces and that Color Painting usually sidesteps, which leads to confirming, wrestling with, and wrangling painting's eternal dualities: abstraction and realism; window and plane; illusion and surface; picture and object; reference and thing. Historically, as pictures, symbols, and objects, painted icons encapsulate these dualities, and are vehicles of emotion, belief, and beauty. Joseph Hughes' paintings are personal icons for believers in the transcendent experience of color and its role in exploring the reaches of our psychological and spiritual nature. They call for and support our discovery of self via observation, conjecture, intuition, and reason. In experiencing these paintings we find an ideal, an archetype for a way to look, think, and feel. Like all abstract painters today, Joseph Hughes risks appearing withdrawn and self-involved in a world on fire. Events have made people wary of the idealism that abstract painting once seemed capable of objectifying by exempting itself from society's traffic in symbols and whimsies. Today's contending winds of ideological fervor form a climate even more dully hostile to abstraction than that of good old-fashioned philistine dismissal. Hughes' recent work at Takada still shuns reference, but its austerity makes room for sour, abrasive sensations in which we recognize all too readily the texture of everyday consciousness. Hughes has slowly loosened his approach in recent years. Faintly modulated color fields achieved by pouring acrylic have given way to an inscrutable combination of pouring and brushwork. 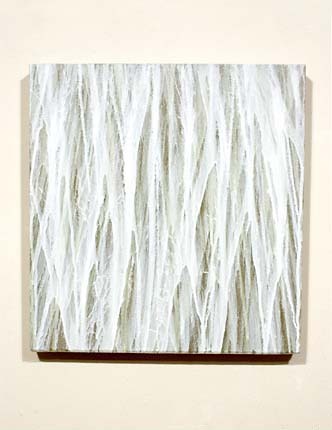 In a picture such as "2006/IV (GREY-WHITE)," the technique produces a thicket of bristled striations that snags the eye like visual Velcro. Not a pleasing sensation at first, but surrender to it and the painting, like most of the others on view, will unfold absorbing ambiguities of color and space. Peeling apart the details of Hughes' work slowly turns into a process of separating the strands of visual awareness, disentangling those spun by words from those not. Joseph Hughes at Takada: Even amid the blare, haste and bluntness of big media, painting and the other static arts remind us what significant differences small adjustments can make. The recent work of San Francisco painter Joseph Hughes, whose show at Takada ends today, proves the point. 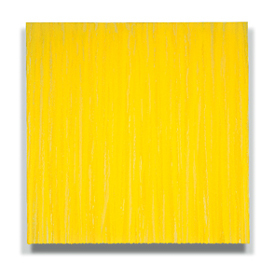 For years Hughes has made monochrome abstractions by pouring acrylic over stretched canvases. The smooth sheets of color that resulted, some with drips trailing at their bottom edges, achieve a soothing objectivity but at a cost of the internal energy that abstraction requires to compel attention. Hughes continues to work by pouring liquid pigment, lighter hues over darker grounds, but he has lately taken to guiding the pours with small brushes. In "2003/ IV (THALO DIOXAZINE)" the technique has yielded a surface thatched with striations of color. The marks appear to dance without Hughes' hand making them do it. Knowing his technique takes nothing away from the impression it creates of paint caught raining down in some parallel climate, a domain that mirrors our own without imitation, much as the painter's consciousness does. Hughes seems to have worked for years on the threshold of this discovery. It has finally injected his painting with the liveliness of expressionism, minus its inevitable hint of self-indulgence. Joseph Hughes is showing six paintings at the Takada Gallery in SF. All are vertical, stout rectangles. Five paintings are in the eighteen to twenty inch high range, and one painting, by far the largest, reaches sixty inches in height. All are painted in acrylic; four, including the large painting, are on canvas and the final two paintings are on linen. Walking in the gallery one initially appears to be confronted with six monochrome paintings, each a different color, but if one spends just a little time with the paintings one finds that there is much more going on here than that. To describe the making of these paintings in terms that sound like a system or method is not to say that the paintings are either systematically or methodically made with a predictable outcome, that they are all the same but just use different colors; it simply means that the artist does employ a process that can be described, and that the paintings are individuals in a family of work exploring a set of problems on which the artist is for now focusing. Hughes' stretchers are actually trapezoids. The top and bottom edges are parallel, but the top is slightly wider than the bottom, which helps the eye make a visual correction so that the stretcher appears to be square. It isn't something immediately noticeable, but if you look close enough you'll wonder if the rectangles are actually square. I thought I saw that the paintings were not square rectangles and asked Hughes about this, which he verified. Most painters today don't do this, though it's not an uncommon technique among painters very concerned about the painting as an object and a perceptual experience. Go back four hundred years or more to look at, for example, paintings made for a particular wall high above the viewer in a church; the height at which the painting is hung requires the viewer to look up at the painting, thus forcing a foreshortened view of the painting, meaning that the painting appears to narrow the higher it gets. If instead the painting is actually physically wider a certain amount at the top it will appear to flatten out to the viewer's eye, preserving the appearance of a square rectangle. The higher the painting, and the larger it is, the wider it may be along the top edge. Various tricks like this can be employed to influence the viewers perception of the work. If one doesn't look close enough at the painting to notice its actual shape then it's easy to accept that it is actually square, which is how perception works. It's an illusion. One could call it realism, in the sense of the commonly accepted use of the word in art: making something appear real or natural through illusionistic means. That's just one little argument in the many I could make that abstract painting is actually realism. It is physical and perceptual, it is an actual viewing experience itself as well as associative, provoking feelings within the viewer that are in the moment, not abstracted or in reaction to a depiction of experience or feeling. But that's another essay. Think of these trapezoids, a means of perceptual correction, even coercion, as the second piece of drawing the artist undertakes in making each work. Yes, it is drawing, because it is specifying a shape: it is a border, a line around what happens inside the painting and the environment that contains it, and it is illusory. But actually, the first piece of drawing is the size of the stretcher, because the size of the stretcher is a factor in the amount of correction required, determining the angles of the trapezoid needed to force paintings of different sizes to read as square. (How is this done? I don't know; there must be some formula, but I've never done it myself. That's a little research project.) And speaking of drawing, and having mentioned how high a painting is hung, there is a final piece of drawing in making the painting, typically considered after the actual painting phase of making the work, which is how high the painting, if it isn't site-specific, is hung on the wall. I've just described several drawing decisions to be considered even though a pencil or brush hasn't even necessarily touched the surface of the painting yet. The actual painting phase in Hughes' process for this group of paintings requires, as I understand it, basically four steps after the canvas or linen support is secured over the stretcher. All painting takes place while the stretcher is hanging on a wall. 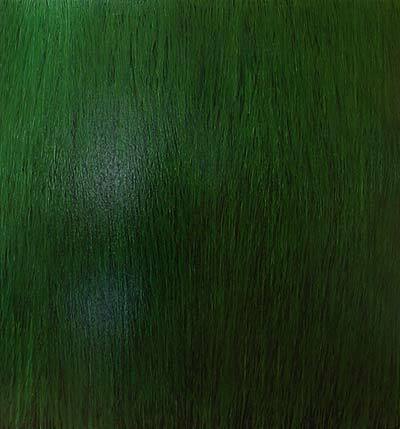 First, the surface is covered evenly by a rolled-on colored acrylic ground; in the series this ground may appear to black, although it is actually a mixed color. When the first ground is dry another layer of acrylic is applied over the entire surface. This ground may have some small amount of acrylic mixed in, but remains transparent. Essentially, Hughes is using a glaze technique. After the second acrylic layer dries a prepared brush is used to paint vertical and slightly diagonal strokes of more fully pigmented acrylic. The prepared brush is a wide, flat brush modified by cutting out sections of the bristles to create gaps so that the brush no longer paints an even, solid stroke. Imagine the original brush like the fingers on a hand, straight and touching sides, forming a solid surface. Now imagine spreading the fingers out so that there are gaps between the fingers. The prepared brush, like spread fingers, will not paint a solid stroke. This is yet another drawing decision Hughes makes: he creates and uses a brush that paints several roughly parallel and separate smaller brushstrokes at once. In addition, he attaches the brush to longer handles, from two to six feet long, so that the brush isn't immediately held in his hand but is extended several feet from his body, transforming the act of painting from mere wrist or elbow movement through his arm and shoulder into the rest of the body. After the stroked colored paint is dry a final coat of lightly pigmented acrylic is poured over the painting. The general approach undertaken at each stage of the painting is one of allover-- the entire canvas is the area of attack during each step, beginning with the design of the stretcher, through the gestural painting, to the final pouring of clear acrylic. At each stage Hughes is dealing with the entire surface as a flat field to be filled, marked, or covered. In the end the painting is a self-contained unit, a single body comprising several layer, each layer a series of gestures, smooth or gestural, designed to span and fit the complete surface. The viewer sees the painting in at least three modes: as a painted, gestural, flat image fitted over the surface; as illusionistic light and space through color and drawing; and as a single object composed of combined materials integrally locked together. The gestural component of each painting is probably most easily taken to be the subject of the paintings, and at least the most immediate level they are, if one thinks that a painting has to present a figure, or depict an object, or wear some kind of decoration, and that any of these is necessarily the subject of the painting. The gesture can be read as figure, object, or decoration, as a thing that exists in an environment or on top of a surface. But there are other components of the painting at work, and the reading of the gesture as a figure is just one of these components working in tandem with the others. The gesture is dependent on the black, a very uncommon color over which to paint--putting aside paintings on velvet--as it tends to kill color primarily because it does not reflect light back through the color on top to the eye. The two layers of poured acrylic, however, are a layer through which light does pass, and these clear layers give each painting a kind of buoyancy, as if the colored gesture is hovering ever so slightly. The bottom layer of clear acrylic separates the gesture from the black ground, and the top layer of acrylic seals-in the gesture, containing it under a clear surface and fixing it within the painting. This shallow space over the gesture wraps the painting up, integrates its components, and makes it a single object. But these two planes of clear acrylic do something very subtle and surprising, something even barely noticeable: the colored gesture is suspended, floats between two clear sheets, like a leaf in a book, an insect in amber, or moisture in a double-paned window, and perhaps even more powerfully: like an image in a mirror or a window. It is an image not quite there, faint and hard to hold. The gesture is a record of the artist's hand, suspended in a strange light in just that moment, and suddenly the painting has incredible depth, while still remaining very much a solid object. The gesture as an image resembles a flash, a stroke like a small explosion, a flower underfolding, an action in the moment. And yet each gesture is a flash as in an idea, like a sudden thought--something flashed in my head, or flashed before my eyes-- and is the manifestation of this idea or thought in an action. The gesture is the least mechanical and least programmed component of each painting. As thin, quickly applied, streaky paint , held between two sheets of acrylic, hovering over a dark background providing minimal reflected light, the colored gesture is almost a glimpse, like something fleeting, but of course is also something static that can be returned to over and over. With this in mind it may not only be that the gesture is the primary image of the painting, but that the entire constructed painting as a fleeting image--black, two layers of clear acrylic, and a suspended colored gesture--is the primary image: it's not a literally a mirror or window acting as a fleeting image, nor is it the painted illusion of a mirror or a window, but instead is a construction that enables the experience of looking at and for a fleeting image. I'd like to suggest that this viewing experience is a primary subject matter of the paintings, and that possible meanings to be found in these paintings include: the act of looking for something; the act of trying to isolate this something; the act of seeing something closely; the act of trying to visually hold on to this something; the act of taking time for looking; and the act of losing sight of something. That the gesture is barely a something, is almost a nothing, allows the viewer to look in a way that emphasizes the experience and the recognition of this experience, not the recognition of a specific object, place, or person, which would make the painting a picture of something rather than something in itself. In this recent body of Hughes' work, however, there is an exception. In the smaller paintings the colored gestures barely cohere into something more than a slight spray, fan, or web-- the flash--which makes them better able to integrate into a painted object. The largest painting is quite a different story. It is covered and filled with a density of strokes that are roughly the same size as those in the smaller paintings. Where the smaller paintings more easily navigate the image/object dichotomy, the larger painting, filled with overlapping strokes, so much more readily reads as a picture. By this I mean something more than the obvious ways in which the many clustered strokes can begin to look like blades of grass, a field, falling or spraying water, or crystals, though they can do that, too. I mean that these bundles of strokes cluster into shifting angles and form what might conveniently be called a cubist kind of space: twisting, sudden changes of directions, and overlapping. This space is one which the viewer experiences and enters, moves within and can find places to anchor to. The large painting, because of its size and the accumulation of strokes, can't possible provide the intimate experience that the smaller ones do. It is a window onto a place with fixed spaces, and so is a representation, a picture. In this respect the large painting never becomes an integrated object. Hughes' paintings are finely crafted. How they are made is clear and consistent. I was most impressed by the bead of acrylic that runs along and stops at all four edges of the canvas as a kind of border. The evenness of surfaces, the fine marks, and the clean edges of the canvas are evidence of the great care with which these paintings have been produced. These details are not small things; to be attuned to this aspect is to find signs that point the way towards the value of close looking, a way that, if followed, shows the viewer that everything counts, that to not closely observe every aspect of each painting is to miss the content and meaning of the paintings. Hughes' conscious, intentional decisions and process, made plain to the careful observer, and the craft by which his decisions and process are carried out, are indicators of the deeper purpose and content of his work. His craft makes possible the joyful rewards from moments of visual concentration and contemplation. Excerpted from an email from Jim Harris to the author on October 23, 2004. During the late 1970's and early 1980's I was painting in close dialogue with a circle of artists in the Bay Area who were exploring the range of experience available through the material structuring of color. A seminal figure in that group of artists was Joseph Hughes. His work, along with our many discussions, left a profound impression upon me. In the intervening twenty-odd years, the "Color Painting" movement has grown to include dozens of serious practitioners all over the world, and many of the painters from that original circle have gone on to gain national and international reputations. While the Color Painting movement now enjoys multinational attention, it can claim substantial roots in the Bay Area, stemming perhaps from the time Still and Rothko spent teaching here. Anne Appleby, Joseph Marioni, and Phil Sims studied at the San Francisco Art Institute. David Simpson and John Zurier continue to work here, as did John Meyer before his untimely death this year. From an art historical standpoint, Color Painting belongs as much to our regional heritage as the figuration of Park, Bischoff, and Diebenkorn. From its inception in the Bay Area, Joseph Hughes has been a key figure in the Color Painting movement. 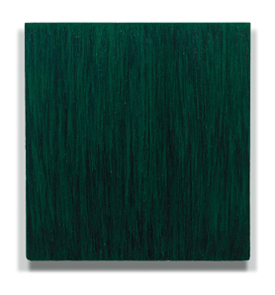 Working quietly and steadily in his San Francisco studio, he has exerted a strong influence on the Color genre. Hughes is an intelligent spokesperson, but more importantly, he is also an intelligent painter. He has resolved, perhaps better than anyone else working today, the dauntingly complex relationship between the immaterial aura of color and the physical support that generates the color image. This is no small task. It is something on the order of resolving the dichotomy between body and soul. Moreover, Hughes has won this resolution not through some stylistic conceit or conceptual positioning, nor through any strategy, but rather though the inherently slow process of maturation. Hughes's genuine accomplishment is due in part to the knowledge of painting he has acquired over the years, and in part to his accumulated wisdom about the fluid nature of color. Considered physically, Hughes' painting keeps the color superbly grounded to the surface of the canvas; considered metaphysically, his painting assures us with equal credibility that color resides in an immaterial realm. This exhibition, a survey of Joseph Hughes's paintings from the past thirty years, gives us a unique and welcome opportunity to experience his work in fullness, and to enjoy the rewards of his remarkable achievement. Hughes came to color abstraction as a young painter in the 1960s through his study of the heroic figures of the New York School, notably Rothko, Pollock, and Kline. His indebtedness to those painters is reflected in his lyrical abstract paintings of the time, which made subtle references to landscape in horizontal compositions of stratified passages of color. As his composition became more individuated and his involvement with color deepened, Hughes came to understand that his true subject matter was color itself. 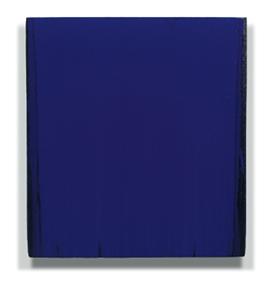 He therefore began to eliminate all representational references from his work and to focus exclusively on developing each painting into a unique image of color. As a result, each painting reveals itself as a kind of ideal presentation of its essential color, with all elements of the painting- size, shape, color, and format- in harmonious support of the color image. By 1972, all of these elements were at work in Hughes' paintings. For example, he began to emphasize the "objectness" of the paintings by altering the edge of each work's support. More extroverted works were made wider at the edge in order to project more from the wall and therefore have a more assertive presence. Hughes also changed his painting process, eliminating the stratified color passages that had characterized his earlier work. Instead, he filled nearly the entire field of the canvas with layered glazes of complementary colors. The basic color of each glaze feathers out at the edge of the composition, giving the work a kind of optical frame that causes the eye to search for the individual color of each glaze without the multi-layered context of the body of the painting. In order to involve the entire compositional field more actively in the color structure of the painting, Hughes began to investigate the technique of pouring the paint to animate each glaze as it was applied. In the 1973 painting 1973/ A6 (YELLOW RISING), for example, we can see how the pouring activates the structure of the color, adding a sense of resolute and perpetual motion to the work. At the same time, below the energy of the painting's active surface, there lies a quiet richness and subtlety of color. 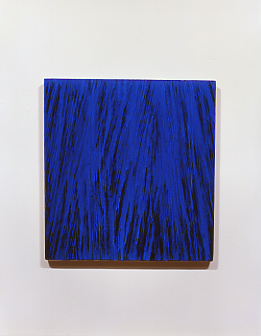 This unique relationship between surface and depth, between movement and stillness, has remained a constant in Hughes's work. In the paintings of the late 1970s and 1980s there is a stronger sense of gesture in the work. Hughes returned to the brush as his primary painting tool, using brushes specially prepared to give him a wide range of gestural possibilities. Generally, these were large, rough horsehair brushes, mounted on long poles that enable him to keep the entire painting in view as he brushed with strong vertical strokes. The roughness of the brushes worked each pigment into filaments that, mingling optically with the other colors, created the impression of a new, single composite color. The visual effect of these paintings is striking. Each painting at first appears to be monochromatic, but as the viewer contemplates the painting further, the "single color" is revealed to contain a multitude of hues. Suddenly stark differences in color are visible, and it becomes clear that the apparently monochromatic image is in fact made up of many separate interweaving colors. As we can see in 1987/ III (DARK BLUE-VIOLET), the single color image projects the richness of its many complementary colors, much as a "green" water lily painting by Monet projects the richness of the distinct blues, violets, and yellows of which it is composed. In the paintings at the end of the 1980s, such as 1989/IV (RED VIOLET), there is a greater sense of fluidity in the brushwork. One senses a stronger acknowledgement of paint as an inherently liquid medium. The paint has been allowed to flow more naturally, with less articulation by the brush, especially in the later applications, giving the painting a looser, freer feeling. This enhanced involvement in the fluidity of the paint continued to develop, and by the following year Hughes had come to define paint as "liquid color." In order to explore this notion more freely, he returned to pouring as his primary painting technique. 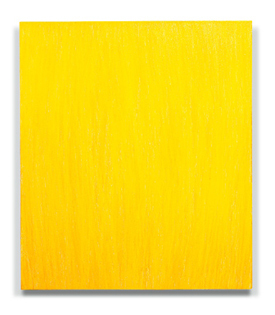 In the painting 1990/ I (CADMIUM YELLOW), for example, the entire color structure is defined by a series of poured glazes. In these paintings generally the paint remains fairly solid at the top of the canvas, but as each new glaze proceeds toward the bottom, it gathers into rivulets, leaving areas of the previous layers exposed. There is an overall shift during this period toward an emphasis on the objectness of the paintings, as Hughes focused on integrating each work's physical properties with its psychological concerns. The supports of the paintings are shaped more radically, so that the stretcher tapers toward the bottom to complement the paint as it flows down the canvas. A spacer has been added to the back of the support, enabling the painting to assert itself as a defined object hanging on the wall, rather than seeming to be an architectural detail. And the back edge of the stretcher has been rounded, so that visually the edge flows more easily toward the space separating the painting from the wall. During this period, too, Hughes was refining the translucent glazing techniques he had been using for a number of years, creating an effect reminiscent of Vermeer and early Rembrandt, who had used glazing to achieve luminous qualities of depth and resonance. As the decade progressed, Hughes concentrated more on this aspect of work, allowing each glaze to flow over most of the canvas before tapering off at the sides and the bottom. In paintings like 1999/ IV (THALO DIOXAZINE), these large areas of glazed color invite intent observation into their depths, much as a quiet lake invites the observer's gaze. The current work has taken on a renewed muscularity, as Hughes has returned to involving more of his own personal gesture in structuring the color. He is using brushes again, for the first time in many years, and there is a sense that he is working more in the paint, rather than merely with the paint. This is not simply a return to an earlier style, but an incorporation of the glazing techniques of the 1990s with the more gestural brushwork that had marked his earlier paintings of the 1980s. An important aspect of this new incorporation is Hughes's method of applying the paint. Rather than using the more traditional process of dipping the brush in the paint and then applying it to the canvas (as he had done in the earlier work), Hughes now pours the paint onto the canvas before working with the brush, using the liquidity of the paint to create a lattice-like structure of brushstrokes over the entire canvas. Because of the translucency of the glazing, the current works appear much more immediately monochrome than the earlier brushed works, in which the individual applications of paint were more opaque and therefore more readily discernable. 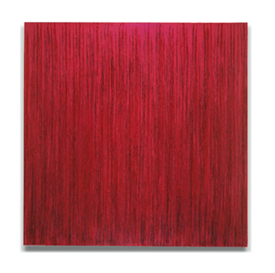 In 2001/ I (CADIUM RED), for example, careful observation reveals that the apparently single hue of red is actually made of of many layers of pigment, but unlike in the works of the 1990s, these glazes have been interwoven by the brush creating an energetic surface texture that is enriched by the layered depths of articulated color. A survey of these three decades of Hughes's painting shows us an extraordinarily rich body of work that has been realized within a framework of exceptional consistency. Like the paintings themselves, Hughes's project immediately impresses with its singleness of purpose, but upon reflection reveals an astonishing range and complexity. Unfettered by the limiting properties of narrative and representation, Hughes has for thirty years been engaged in a focused exploration of the nature of color, and through the actualized images of color he has created we are free to participate with him in that infinitely rewarding experience. San Francisco Chronicle, December 20, 2008. Ashley, Chris. "The Paintings of Joseph Hughes: Icons of Color,"
room for painting room for paper, San Francisco, 2008. Baker, Kenneth. "Hughes Paintings at Takada,"
San Francisco Chronicle, September 16, 2006. Baker, Kenneth. "Joseph Hughes at Takada,"
San Francisco Chronicle, October 30, 2004. Ashley, Chris. "Seeing the Hovering Image: Joseph Hughes' Recent Paintings,"
Lawson, George. "Joseph Hughes and Color Painting,"
Joseph Hughes: Paintings 1972-2002, San Francisco, CA, 2002. Lavino, James. "The Image of Color,"
Weinstock, Nino. Radical Painting und Prasenz der Farbe, Richter Verlag, Dusseldorf, 2001. Bonetti, David. "Berkeley Museum: Showing Off Its Assets,"
San Francisco Chronicle, March 4, 2001. Lewallen, Constance. 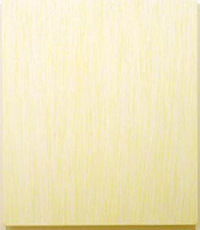 "Minimalism Then and Now,"
Look (Berkeley Art Museum), Fall, 2000. Lavino, James. "Movement and Stillness,"
Kokot, Sharon. "Colors Speak for Themselves,"
Columbus Dispatch, April 11, 1999. Schieber, Curtis. "Radical Concrete's Rock-Solid Modernism,"
Clark, Margaret Anne. "Painting as Meditation,"
Bonetti, David. "Taking Abstraction to Ground Zero,"
San Francisco Examiner, April 12, 1996. San Francisco Chronicle, October 21, 1993. Bonetti, David. "Art: At the Galleries,"
San Francisco Examiner, September 22, 1989. Baker, Kenneth. "Abstracts with Depth, Complexity,"
San Francisco Chronicle, September 21, 1989. Brunson, Jamie. "Bay Area's Response to Postmodernist Abstraction,"
Baker, Kenneth. "Displays of Paintings, Not Pictures,"
San Francisco Chronicle, September 19, 1988. L.A. Art Scene, July/August, 1987. Gardner, Colin. "The Art Galleries/La Cienega Area,"
Los Angeles Times, June 19, 1987. Cebulski, Frank. "Color As Perception,"
Art Week, January 22, 1983. Albright, Thomas. "Personal, Fresh Approaches,"
San Francisco Chronicle, January 13, 1983. San Francisco Chronicle, February 27, 1982. Dunham, Judith L. "Joseph Hughes' Dual Series,"
Art Week, November 22, 1975. Albright, Thomas. "Catching the Art Critic Off Garde,"
San Francisco Chronicle, November 15, 1975. Bowles, Jerry. "Young Artists Leave Big Sur for Big Apple,"
Staten Island Advance, June 2, 1974. Albright, Thomas. The Way It Was: San Francisco,"
Allman, Paul. "Three Artists In Their Quest for Vision,"
San Francisco Phoenix, September 13, 1972. Fried, Alexander. "The Lively Arts,"
San Francisco Examiner, August 17, 1972. Albright, Thomas. "Hughes' Studies in Colors,"
San Francisco Chronicle, August 3, 1972. Albright, Thomas. "Fragile Watercolor Abstractions,"
San Francisco Chronicle, August 21, 1970.